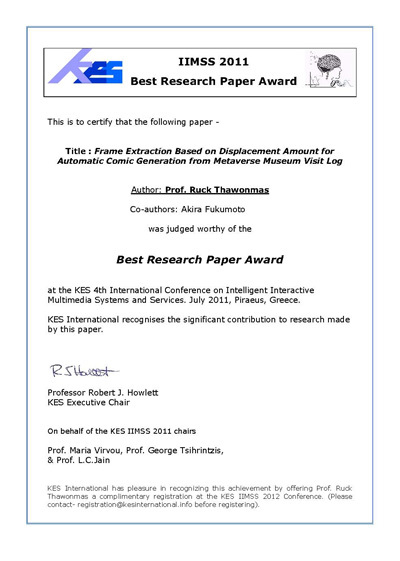 Our members were awarded KES IIMSS 2011 Best Research Paper Award for the following paper -- presented at the KES 4th International Conference on Intelligent Interactive Multimedia Systems and Services on July 21, 2011, Piraeus, Greece. This picture was taken in the Poster session on Monday 20, 2011 at Stanford University. I was presenting the proposed visualization as a visual analytic tool for museum curators. This paper considers the use of a layout-independent display for visual analysis of the path and residing time of the movement data in circulation, named “PARTY”. PARTY is an abbreviation of Path And Residing Time display. Taking for example a museum in a 3D virtual world, the circulation behaviors of visitors moving through museum of interest are influenced by the items on which the visitors focus their attention. 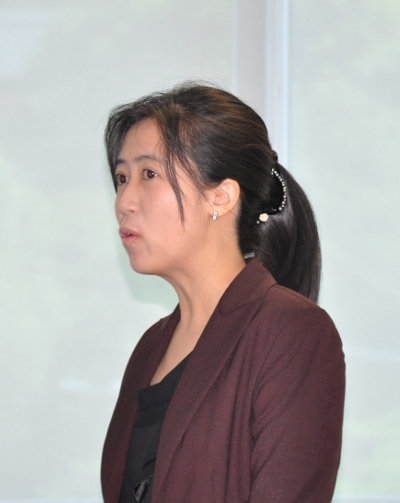 I attended the Workshop on Digital Media and Digital Content Management (DMDCM) at Hangzhou China during May 16-17, 2011 and presented my research paper entitled 'Spatiotemporal Analysis of Circulation Behaviors Using Path And Residing Time DisplaY (PARTY)'. With the Daikokai program of Ritsumeikan University, I visited at Institute for Media Innovation for 2 months during Jan 10 - March 10, 2011. My research theme of this visit is about "Model of visitor circulation in Second Life". During staying at IMI, I got a useful guidance of my co-advisor at IMI, Professor Nadia Thalmann, and my supervisors at Ritsumeikan Univ, Prof. Ruck Thawonmas and Prof. Frank Rinaldo, Thank you for online video conference technologies, I also had a weekly meeting with my supervisors via Skype. During staying at IMI, I gave an invited talk in a Ph.D. seminar of IMI on Feb 22 and had a presentation of my paper in GAMEON ASIA Conference at Digenpen during Mar 1-2. The GAMEON conference arranged a good event like a visit at Fusion world where is a showroom of state-of-art technologies supported by the Singapore goverment. On Mar 4th, it was very great that I joined a meeting of Prof. Inaba and Prof. Nakamura with the NUS Second-Life team who have developed seriouly SL as an e-learning platform since 2007. 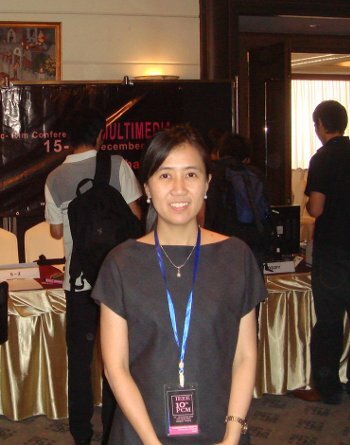 Advances in Computer Entertainment Technology (ACE2010) was one of great conferences in GAME. In this year, the conference was held in the city of Taipei during November 16-19, 2010. There were variety of interesting events including paper, poster, and showcase sessions as well as social activities. The topic of my presentation there was "Spatiotemporal Analysis in Virtual Environment by Using Eigenbehaviors". Kingkarn Sookhanaphibarn, Ruck Thawonmas, Frank Rinaldo, and Kuan-Ta Chen, "Spatiotemporal Analysis in Virtual Environments using Eigenbehaviors," Proc. of the 7th Advances in Computer Entertainment Technology Conference (ACE 2010), Taipei, Taiwan, paper 249, Nov. 17-19, 2010. I gave a presentation in World Congress Conference held at Brisbane, Australia, during September 20-24, 2010. My talk was in title of "An on-line classification approach of visitors's movement in 3D virtual museums"
Recently I participated in DH2010, the annual international conference for digital scholarship in the humanities, sponsored by the Alliance of Digital Humanities Organizations. DH2010 was hosted at King’s College London by the Centre for Computing in the Humanities and the Centre for e-Research, with the support of the School of Arts and Humanities, Information Services and Systems, and the Principal, Professor Rick Trainor. At DH2010, I participated in a paper session whose theme was Visual Art/Visualization, the chair Prof. Charles van den Heuvel, and my paper’s title Contexts, Narratives, and Interactive Visual Analysis of Names in the Japanese Hyohanki Diary. This paper was based on a previous research presented at DH2009 at the University of Maryland, US. By Kingkarn (Ploy) Sookhanaphibarn, Ph.D. It is my pleasure to write about Digital Humanities 2010 during July 7-10, held at King’s College London, Strand Campus. Digital Humanities is the annual international conference for digital scholarship in the humanities, which was held at Maryland last year and will be held at Stanford USA next year. The conference had a variety of events not only academic but also social programs. The academic program started from six workshops two days before the conference, and then consisted of 36 parallel sessions and four poster sessions. The social programs are three reception parties and banquet, which all participants enjoyed musical performances and tasted English wines. My talk was in the Visualization session on Friday 9th, where Prof. John Unsworth was the chairman. There were so many questions from audiences who were interested in my research topic. In the conference banquet, I was honored to receive the 2010 Bursary Award, for young researchers, from the Alliance of Digital Humanities Organizations. Therefore, I was very pleased to share my success with all members in the GCOE program. Lastly, I would like to thank you the GCOE program with all of you directly and indirectly giving me comments and suggestions in my research so that my research paper was qualified. Recently I participated in two international conferences: EuroVis and Nicograph. 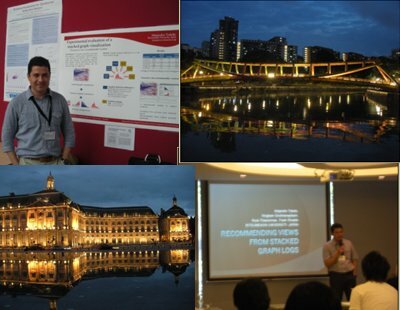 EuroVis is the annual visualization symposium jointly organized by the Eurographics Working Group on Data Visualization and the IEEE Visualization and Graphics Technical Committee. NicoGraph, on the other hand, is organized by The Society for Art and Science. This year EuroVis took place in Bordeaux, France, where I participated in a poster / demo session. At Nicograph, this time in Singapore, I participated in a paper session. During both events, I presented the results of a research on information visualization and visual analytics that our research group has been recently conducting. Basically, this research focuses on the analytical side of information visualization systems, e.g., how effective they are as cognitive tools. As in a previous work, we continue the work on the Stacked Graph visualization and now our system has an extension to enable visual analytics on it. This new functionality has been tested on a usability study and reported to be presented at EuroVis and Nicograph. 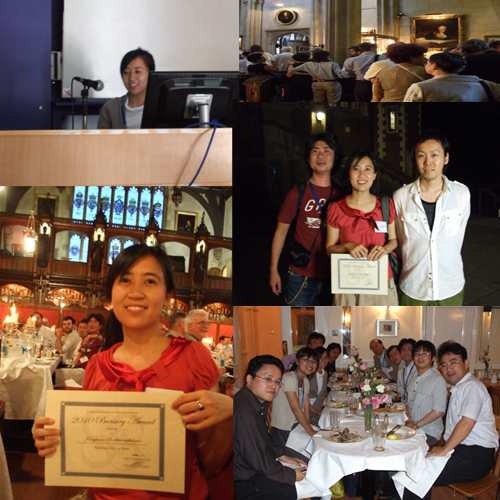 This blog is going to talking about the recent conference, PCM 2009. 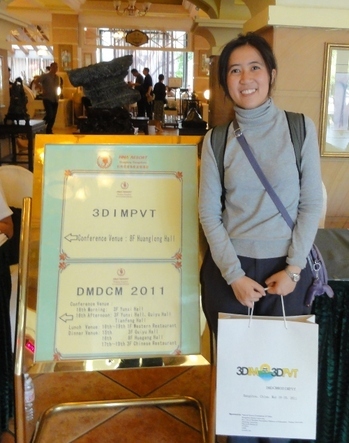 This 2009 IEEE Pacific-Rim Conference on Multimedia was held in Bangkok, Thailand, during December 15-18. The conference emphasized the multimedia technologies and the user behaviors. First, The video analysis and application, including the network technologies that will be a future trend of Youtube and multimedia in hand-held equipments, have been received much attention nowadays. Second, the user behaviors are increasingly beneficial to the industrial sector in the product design. The rest of this Blog will focus on the user behavior in which my research is categorized. One of seventeen papers present a music recommendation system, which provides an automatic and personalized music playing service based on the time parameter and user’s interesting. Its title is Intelligent Music Playlist Recommendation Based on User Daily Behavior and Music Content. The recommendation system used the training set from the user’s music explicitly rating history and the associated time stamps. Then, the widely used techniques such as artificial neural network and decision tree were used as the kernels of the system. Another paper is a recommendation system for campus-living style. Its system name is the CampusGenie system. This system used the recent technology of GPS navigator with WiFi network to provide the active assistance to students for their life in the campus. This paper showed the prototype that fully utilized the campus outdoor context to assist the freshman to adapt to his college life. My paper is A Movement Data Analysis and Synthesis Tool for Museum Visitors’ Behaviors, which analyzes and synthesizes visitors’ behaviors in museums and art galleries by using our defined parameters. A visit time and a observation distance can be calculated by using the proposed functions. The proposed synthesis algorithm is developed and used in classification. Classifying visitor styles is simply implemented by using the average and variance of their stopover time at and distance to all exhibits as shown in this paper. It was a great opportunity that I could attend to this conference by the traveling grant of GCOE program in Ritsumeikan University. I would like to acknowledge my supervisor, Prof. Ruck Thawonmas and the GCOE program. I also would like to credit Prof. Luca Chittaro, whose research inspired me to synthesize the user movement in museums as published in this conference.